PV systems require equipment other than the external modules in order to operate. This is normally installed inside the building, and can go anywhere between the modules and the incoming electrical supply, depending on space and aesthetics. We would discuss cable runs and equipment positions during a site survey. The inverter is the "brains" of the system; this changes the D.C. current from the modules to the correct frequency of A.C. current, and transforms the voltage to 240v. The inverter monitors both the D.C. and A.C. side and protects the system by shutting it down if a fault occurs. As soon as it registers that everything is normal, it will restart by itself. The inverter will gather data on a wide range of values including mains and PV voltage, current, operating hours and PV generated kWh. It will show the main figures on the front cover display, but the system can also be monitored in a number of different ways such as a remote display (large public one or desktop), on a local computer, or to the world via the internet. 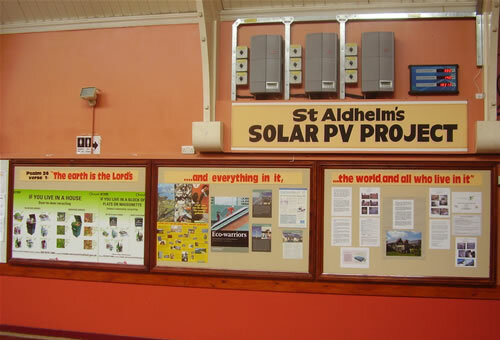 On the 5th of August 2008 we commissioned a 5.25kWp domestic system. There are 15 x Sanyo 210W modules facing West, and 10 facing East connected to Fronius IG30 and IG20 inverters respectively. The orientations are not ideal, and there is some shading from a tree to the West, resulting in overall generation of 760kWh / kWp / year (around 85% of generation from optimum positioning).. However, the system does make an interesting study because of this and is connected to the Fronius Web Portal. Follow the path; PVSystems / Home(Julian) to see the data. 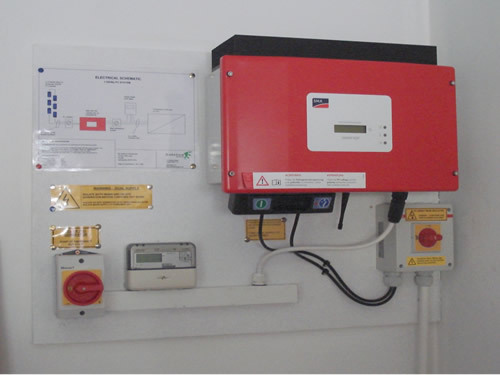 It is common practice to undersize the inverter(s) when designing PV systems. 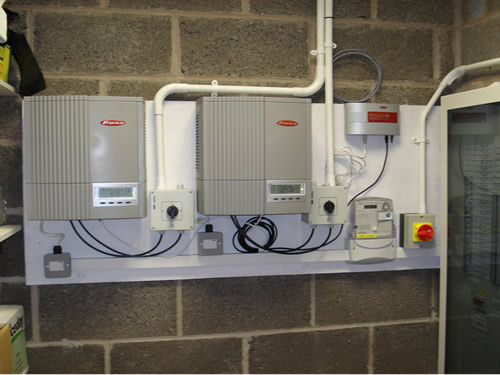 For example, we might install 18 x 175Wp modules (3.15kWp) connected to a Fronius IG30 inverter, which is capable of generating a maximum of 2.65kW a.c. New customers are often concerned at the limited power output on bright sunny days when they would expect to see the a.c. output reach the full rated power of the system. The reason for this is that the more powerful an inverter is, the higher the power range is at which it is most efficient. If the inverter is sized to make maximum use of the brightest sunniest days, then it will not be sized to make the most use of the many more grey days we have in this country. Temperature is also a consideration here because the voltage of PV modules drops off when they are hot. Peak module power is determined in a lab under STC (Standard Test Conditions) of 25deg C and 1000W/m2 of light intensity. So those summer days are great for generating lots of power because they are long, not because they are hot. The ambient heat plus the heat produced by the modules themselves mean that peak power in the Summer does not often reach peak rated power. The system is more likely to reach peak power on a cold sunny Winters day (but then these days are few and far between and short). Inverter sizing is done with the aid of inverter manufacturer’s software, and we can provide a print-out for your system.